Fake blood, heavy lipstick and thick eyeliner are no match for our suggestions! It’s that time of year when ghastly ghouls and wicked witches roam the streets in search of the neighborhood’s best candy. It’s also that point when we evaluate how we each did in preparing scars and bloody appendages with costume makeup. But the stains that costume makeup produces could be even more of a scare than you would expect. 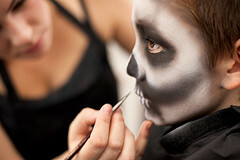 We have a few suggestions on how to keep the living dead looking fresh. Let’s try to avoid stains all together! It would be in your best interest to apply makeup before getting dressed. If you are already dressed, wrap a towel or sheet around your neck and shoulders. If you are truly in a bind and need professional grade washing, browse through our list of laundromats throughout New Jersey!